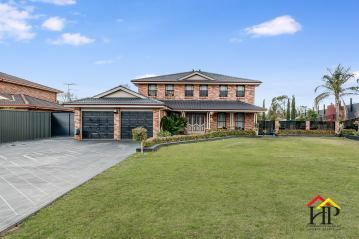 This rare find is perfectly positioned within walking distance of the lake and all amenities, including Bunnings, which is literally across the road. The 2 storey residence flows seamlessly and offers 4 bedrooms plus a study or 5th bedroom, a stunning ensuite renovation that wouldn't be out of place on The Block, separate formal and informal living and a gorgeous kitchen that is sure to please the chef in the family. Designed with entertaining in mind, you will fall in love with the stunning entertainment deck, that really extends the living from inside to the outdoors, with room for the family to spread out and enjoy summer BBQ's, or just relax and enjoy watching the kids in the sparkling inground pool, or play cricket in the impressively large backyard. This amazing property has been thoughtfully designed to accommodate all of your toys, with a double garage and side access that runs down the length of the home and well secured to protect them. A property like this can only be truly appreciated by a personal inspection, so call 4647 3999 now to arrange a time. - 1249m2 Block - 4 Bedrooms plus Study or 5th Bedroom - Separate Formal and Informal Living - Superb Outdoor Entertainment Area - Air Conditioning - Inground Pool - Perfect Position - Huge Side Access - No Community Title Fees ALL PROPERTIES ARE AVAILABLE TO INSPECT BY APPOINTMENT OR AS ADVERTISED Harrington Park Real Estate have in preparing this information used our best endeavours to ensure that the information contained herein is true and accurate. Prospective purchasers should make their own enquiries to verify the information contained herein.